Enroll now with Vanguard to start saving today! You’ll need your plan number: 092538. The company provides competitive benefits that give you the flexibility to reach your future financial goals. Contribute on a before-tax, after-tax, or Roth 401(k) basis, or a combination of all three, up to the IRS limits. When you contribute a minimum of 1% of your eligible pay each pay period, you will receive a 6% company match with a 0%-6% company discretionary contribution. 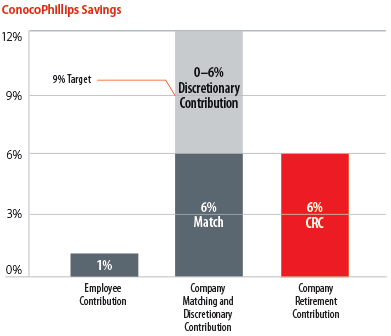 The target for the discretionary contribution is 3%, for a 9% total company contribution. The discretionary contribution of 0%-6% will be based on factors such as company performance and market conditions. It will be reviewed twice a year for the January – June and July – December periods and deposited as a lump sum into your account following your savings plan investment choices. You’re always 100% vested in your contributions, company match and discretionary contributions. Eligible pay includes base salary and overtime. This plan is voluntary – you decide whether or not to enroll and where to invest your account funds. You must enroll with Vanguard to participate. If participating, you will receive 6% of your eligible pay each pay period in your account at Vanguard. ConocoPhillips provides 100% of the CRC. The CRC does not require any employee contributions. After three years of service with the company, you are 100% vested in any company retirement contributions. Eligible pay includes base salary, overtime, and bonus.